Mr. Shahid Usman Balwa is the Vice Chairman and Managing Director of DB Realty, one of India’s largestreal estate development companies based out of Mumbai. With over 20 years of personal experience in the hospitality and construction industry, Mr. Balwa hails from a family established in the hospitality industry for nearly a century. 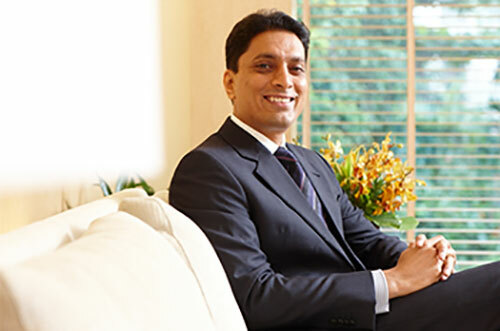 His unfaltering ambition has earned him recognition as one of the most successful and driven businessmen in Mumbai. At the age of 23, Mr. Shahid Balwa diversified from his family business, partnering with Mr. Vinod Goenka to spearhead the DB Group of companies in the business of real estate development. The initial undertaking that brought these individuals together was the construction and introduction of the five star hotel, Le Royal Meridian, Mumbai. An experienced hotelier, Mr. Shahid Balwa took charge of the implementation and operation of the hotel, now known as The Hilton Hotel, Mumbai, winning it a number of internationally renowned awards. Maintaining the Balwa family expertise, DB Hospitality, a subsidiary of DB Group also constructed the spectacular Hotel Grand Hyatt, Goa. Independently, the Balwa family owns The Balwa’s Hotel in Bombay Central, amongst others. Under the leadership of Mr. Balwa and Mr. Goenka, DB Realty has become a leading real estate development company, listed on both, the National Stock Exchange as well as the Bombay Stock Exchange in 2010. Mr. Balwa has contributed to the group’s expansion and growth through the construction of several residential and commercial buildings and the acquisition of properties. With real estate projects in Mumbai and Pune, the company has more than 40 luxury projects, spread over 90 million sq. ft. of land. DB Realty has also developed the extensive 8 million square foot Slum Rehabilitation project at Mahul and handed it over to the government. In addition to residential and SRA projects, the company has three completed commercial projects to add to its growing list of achievements. Amidst all this, Mr. Shahid Balwa also spends his time giving back to the community in the fields of health and education. The Balwa family migrated to Mumbai from their native Gujarat, where they still maintain their roots. His family’s school, The N.M. Balwa Higher Secondary School in Pirojpura is a well‐respected co‐educational institution sponsored by the Balwa Charitable Trust Mumbai and managed by the Balwa Education Trust in Pirojpura. Never one to let education take a back seat, Mr. Shahid Balwa wishes to set up educational institutions in Pirojpura, to provide education to more than 10,000 students. A man with undeniable panache, his flair for designing buildings and the will to build some of India’s iconic structures has caught the attention of the likes of Sir Norman Foster as well as various esteemed peers of the Young Presidents Organisation (YPO), of which he is also a member. Additionally, he has been recognised by the Economic Times, winning the Indian Business Tycoon Award from ACE, as well as joining the ranks amongst the 10 youngest Indians to feature on the Forbes List of Indian Billionaires in 2010.